Holy moly. This is one of the best steaks I’ve ever made at home and I’m not trying to brag. 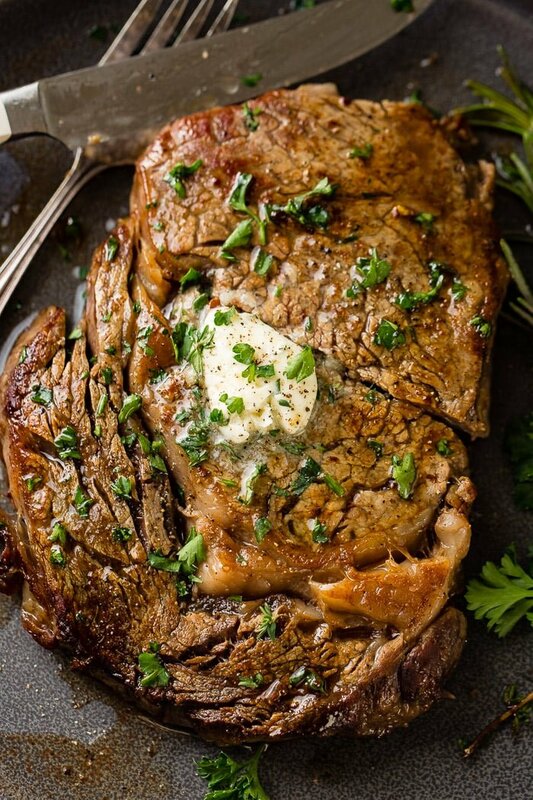 Easy Garlic Butter Steak at Home just became our favorite! Have you ever had a steak so perfectly cooked and seasoned it literally, and I know this doesn’t seem possible, but it literally melts in your mouth? Oh man, it’s like nothing can ever compare to a steak like that again! 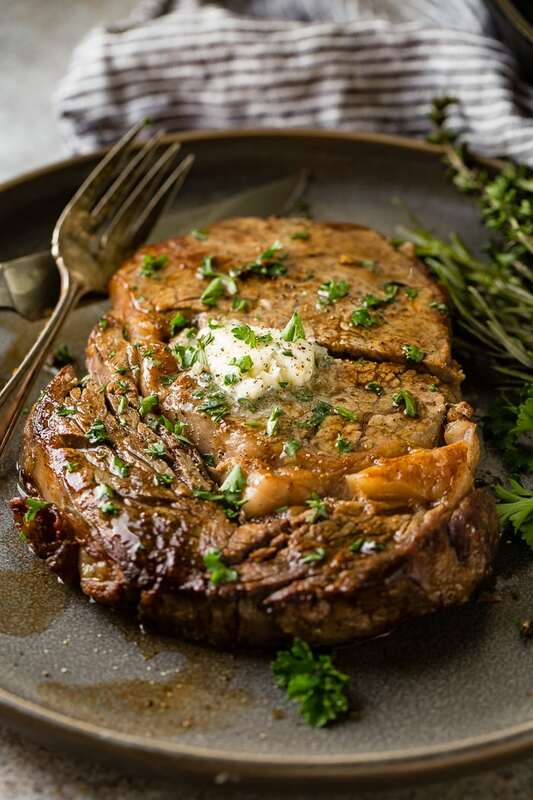 This Easy Garlic Butter Steak at Home is just that kind of steak, but you can make it without ever leaving your house. One of our favorite steakhouses serves up the most amazing steak I’ve ever had and it has this melting garlic butter that’s dripping down the sides and sizzling away on the screaming hot plate. And I mean, it’s a SCREAMING HOT plate. They set it down and warn you 100 times not to touch the plate or you’ll burn your fingers. I bet you’ve had one like that before. I can taste it just in thinking about it. I’ve learned a few important lessons about steak, especially about cooking steak at home, so let’s go through all of those things. 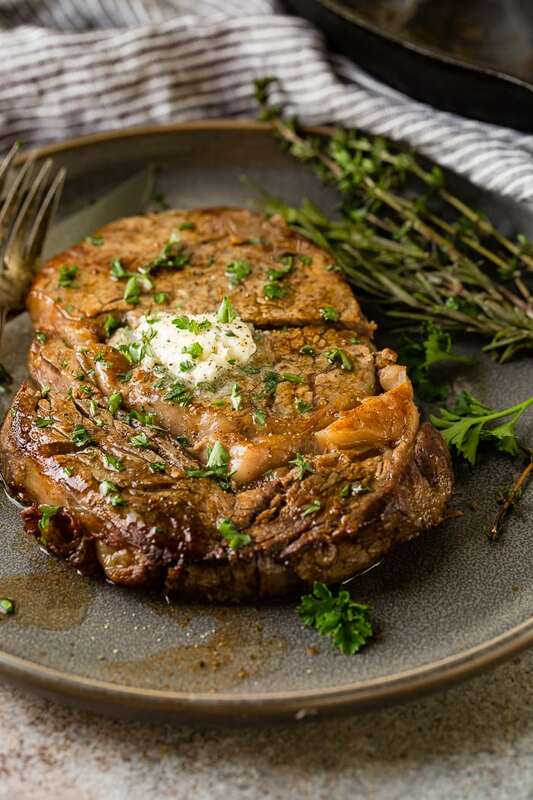 This easy garlic butter steak at home is going to use both the stove top and the oven. Make the garlic butter and quickly store it in the fridge as we won’t need it until serving. Prepare the steak at least 45 minutes ahead of time. I generally do the day before or morning of. You’ll sprinkle the steak with salt and let it rest in the fridge, uncovered. 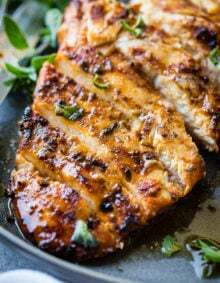 This dries out the meat’s outside for a great sear, flavors the meat and helps to break down the proteins for a tender, juicy steak. 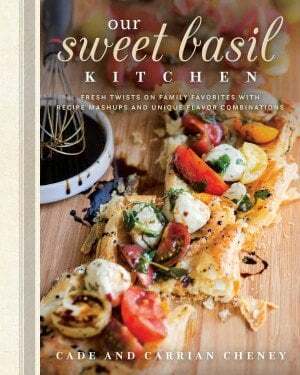 Heat the oven WITH a Cast Iron Skillet in it. We want that skillet hot before the steak even touches it. But we don’t start the meat in the oven, we move the skillet to to stove top so there is heat only coming from the bottom. We are looking to sear the meat, not cook it through yet. Remove the skillet from the oven to an already heated stove top and sear both sides of the steak. Now, everything goes back in the oven to cook it to the desired doneness. The most important step is to now pull the meat, set it on a cutting board and allow it to rest for a few minutes. This is to redistribute the juices so when you cut into the steak it’s perfectly tender and juicy. Finally, slice up a little garlic butter and serve! The biggest reason that your steak gets tough is probably that you overcooked it. But that’s not the only reason. Overcooking steak- Overcooking any meat can cause it to become tough. This is because heat causes the proteins in the meat to become more tight and firm, just like your buns when you work out. 😉 It also basically squeezes the juices out of it, making it dry and tough. Buying the Wrong Cut of Steak– Not all steaks are meant to be eaten like a steakhouse steak and shouldn’t be substituted for each other. Leave flank and skirt steaks for when you’re doing slices of meat like a stir fry, carne asada or fajitas. A ribeye, T-bone and others are more for sitting down with a knife and fork. Old Meat– I hate to say this, but if meat is old it’s missing fat and tenderness. What the steak is being used for, like what I mentioned above. Your own preferences. Some people love a T-bone steak. I think it makes them feel like a boss to have that big ol’ bone in there. I don’t love it because there isn’t as much meat and it’s a hassle to cut around. What Kinds of Steak are There? There are a bunch of different kinds but let’s just stick to a few. Ribeye- A ribeye is a great steak because it has beautiful marbling and it turns out so juicy and beefy in flavor. It’s one of my favorites even though there is more fat than a filet so you will have to do some trimming AFTER it is cooked. Never before as we want that fat to be flavoring the meat. T-Bone- Some restaurants call a T-Bone steak a Porterhouse steak but they are in fact the exact same thing. The T-Bone is tricky to cook as it’s actually both a beefy tenderloin steak and a strip steak. But it has great flavor and it can be fun to have both worlds. Filet Mignon or Tenderloin– Ah yes, the most ordered steak when you’re feeling fancy. Would you like a secret though? The ribeye is actually the nicer steak. Yup. Restaurants are fooling you by marketing a less superior steak as the prized offering. This steak is buttery and mild and definitely tender when cooked properly. The only downfall is missing out on that beefy flavor. New York– The New York steak has that fat around the outside and barely any marbling throughout the middle. It’s a good steak but not as tender as others. 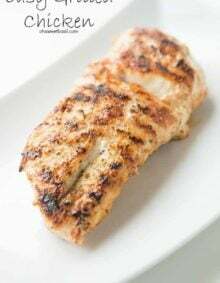 Flank– The flank steak used to be a cheaper steak that was great for carne asada, fajitas etc but the more popular those dishes have become the more the steak has gone up in price. This steak is tapered at one end so it’s best to cut it in half to cook it so that you don’t have one end over cooked and the other raw. So, that didn’t help. You just want to know what steak is best, right? We stick with a ribeye or a filet. We love the beefy flavor and the tenderness of the meat. As stated above, the filet wins out for the most tender cut of steak to buy, but the ribeye is a close second followed by the T-bone steak. Guess what, if you’re wondering when to salt steak, it’s not in the cooking process at all. Salting your steak should begin anywhere from 40 minutes to 24 hours ahead of time. This really gets into the meat and also helps to break down those fibers. You really shouldn’t cook steak immediately after salting as the salt just comes off. Steaks most definitely can be cooked in the oven and you’ll see that we do exactly that. You have to be very mindful when doing this though. You can easily overcook a steak with that much heat. 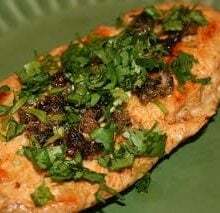 You can reheat steak, but you should avoid the microwave which cooks too fast and will change the inner temperature of the meat and the texture. Instead, place the steak on a pan with foil over it and heat it in a low oven. Once hot, place it in a very hot pan just to re-sear the outside. Looking for more steak recipes? 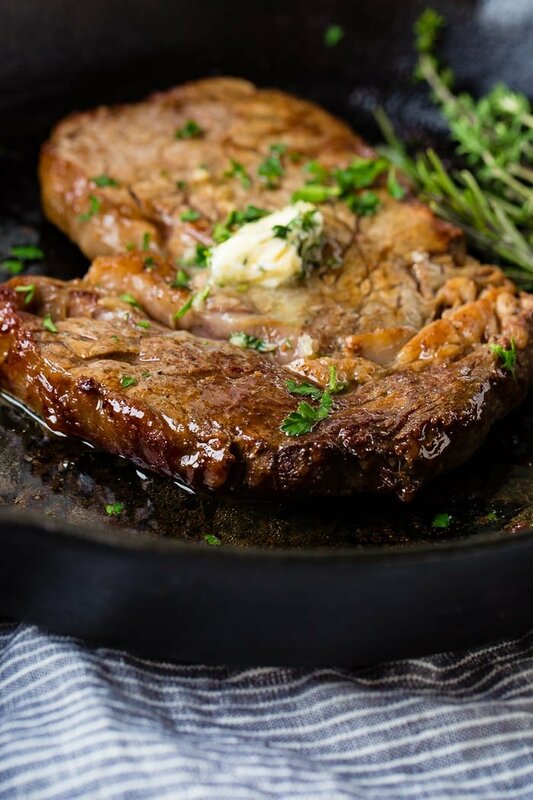 A good steak is so good, so make sure you try our FAMOUS Porterhouse Steak and Mushrooms, Flank Steak, Easy Grilled Steak Burrito Bowls, Steak with Homemade Steak Sauce or How to Make Steak Without a Grill! Holy moly. This is one of the best steaks I've ever made at home and I'm not trying to brag. 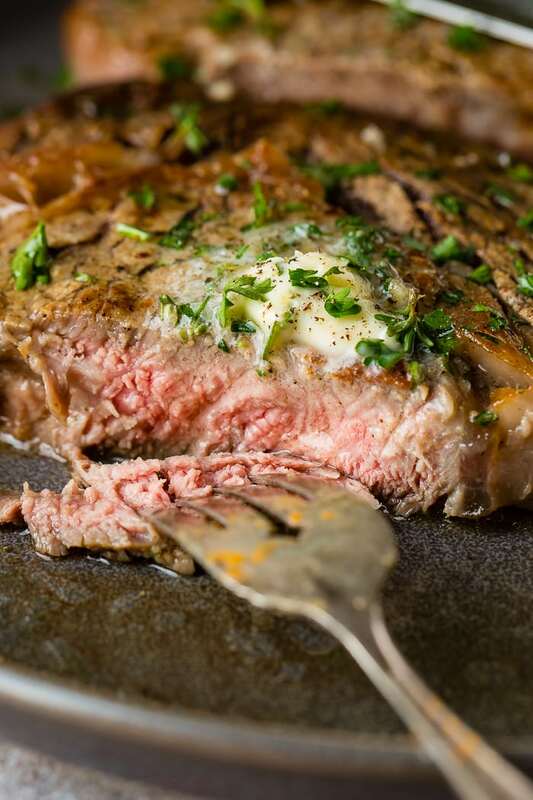 Easy Garlic Butter Steak at Home just became our favorite! 3 cloves garlic, minced (especially wonderful if you use roasted garlic. To make the garlic butter, combine butter, garlic, salt, and pepper. Transfer the mixture to parchment paper; shape into a log. Roll in parchment to 1 1/2 inches in diameter, twisting the ends to close. Refrigerate until ready to use, up to 1 week. Preheat oven to broil. Place an oven-proof skillet, we prefer to use our Lodge Cast Iron Skillet, in the oven. Using paper towels, pat both sides of the steak dry. This is essential to get a nice caramelization on the steak. Drizzle with olive oil; season with salt and pepper evenly to taste. Remove the skillet from the oven and heat over medium-high heat on the stovetop. Once the pan is hot, place the steak in the middle of the skillet and cook until a dark crust has formed, about 1 minute. Using tongs, flip, and cook for an additional 60 seconds. Remove the skillet from the stove. Place your skillet into the oven and cook until desired doneness is reached, about 4-5 minutes for medium-rare, flipping once. Let rest for 3-5 minutes, tented, not wrapped with foil. Serve immediately with a slice of garlic butter. Steaks can be tricky to buy. The ribeye is one of the most flavorful cuts of steak, however a filet, New York or T-bone would work as well. Ohhhh, this steak sounds amazing! I would probably say 5-7 minutes depending on how thick your steak is. Enjoy! This is going to the top of my “must try” list! Do you find you can cook all three steaks at once, or better to give each their own space? I’m drooling just thinking about it now!! You can do all three at once if you have a good size cast iron skillet. Just make sure the pan isn’t overcrowded and you should be fine!